Summer vacations are the time to break free from the monotonous everyday routine and indulge in some fun and adventure. Holidays are totally fun for kids as they get a big break not only from schools but because they look forward to so much more they get to do while at home or away from home. Though vacations are usually exciting for kids… It can be equally taxing for parents to manage kids along with the rest of the household chores and work. So what have you planned for your child this summer ….?? How about making the most of their holidays by letting them free to explore some crazy little activities designed for them to challenge their curious minds? Here I would introduce you to the brand new fun activity product that’s not been launched in the market yet and my review of the product “The crazy Scientist Box” from the brand “PodSquad“. It’s a brainchild of Ms. Abha Shah, the founder of PodSquad. Behind PodSquad is a passionate team of educationists, children’s writers, designers and teachers who have contributed through decades of experience behind them. PodSquad is based on a -“Theory of Multiple Intelligence” proposed by Howard Gardner. The theory suggests every child is unique and is born with 9 intelligence’s (also known as the 9 SMARTS) some more pronounced and some less. It’s important for parents to identify the child’s aptitude early on by exposing them to various opportunities to explore. PodSquad is designed keeping in mind the above aspect of a child development and their uniqueness. 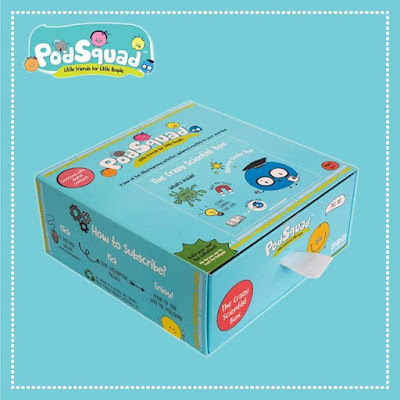 PodSquad box is a fun filled learning activities delivered monthly to your doorstep to keep your highly enthusiastic and energetic child occupied while catering to all his needs of fun, play & learning and promises a peaceful time for parents too! Ah! a sigh of relief! My first ever PodSquad box arrived yesterday. 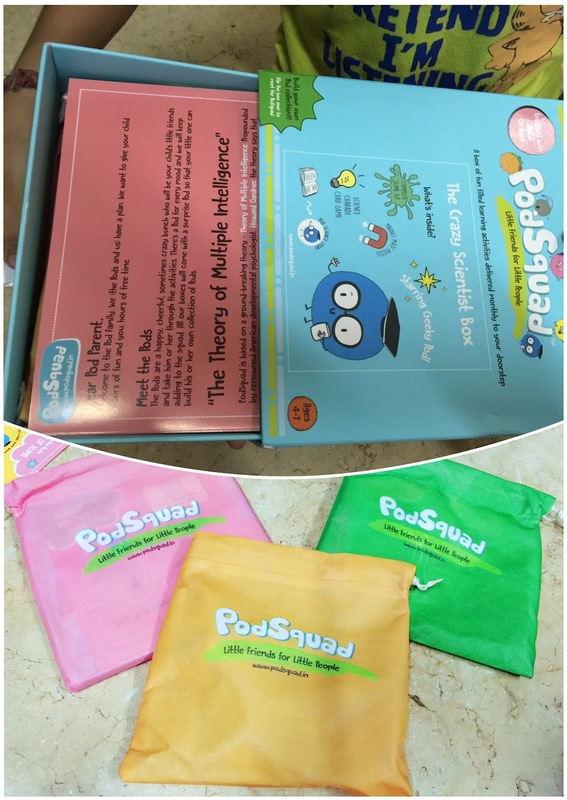 The look of the box is kept simple yet attractive with the picture of pods to introduce your child to all possible kinds of pods he/she can think of as a playing companion. 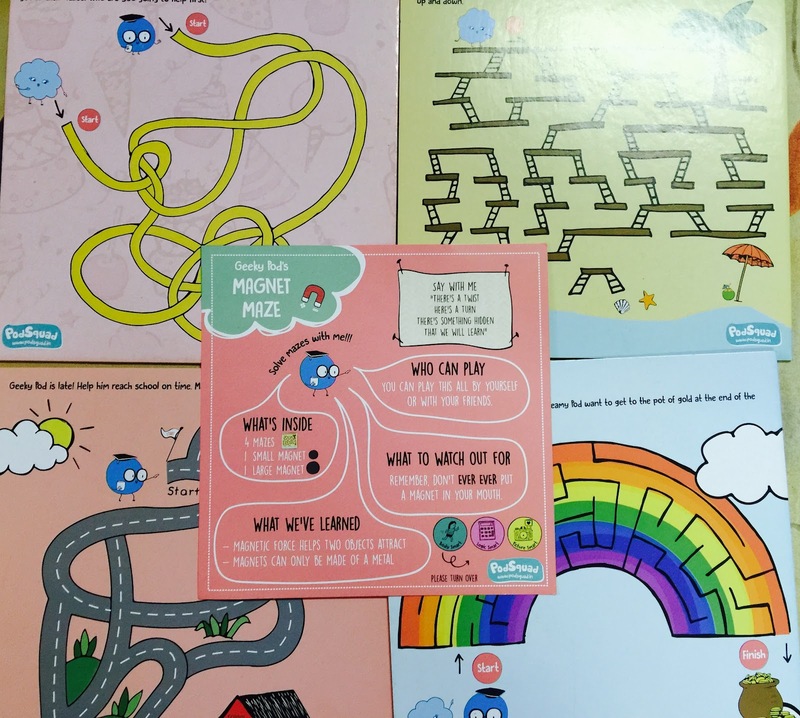 The box clearly mentions… all the important information one would seek about the product including a brief description of activities that comes with the box, the learning approach and the subscription details. I liked the packing of the box .. It’s hassle-free and different from other packings that usually requires a pair of scissors and turns out to be a struggle for kids to tare open it. A box has a small flap attached that slide opens the box which can later be used as a drawer for kids to keep their stuff. a big plus as my son smilingly opened the box and needed no assistance which he usually does. Each activity is further divided and packed separately in reusable string-bags to ensure there is no mix of activities happen even while you leave it all by your kid. Each activity bag comes with well explained instruction’s chart that’s simple to understand for any kid within the given age group. All the material required is provided along with the measure that’s needed for the activity and labeled for easy understanding and use. The step-wise procedure makes it easy to comprehend and follow avoiding any confusions at all. The explanation through images along with the instructions helps the child relate better while he is on the go. The activities ensure child works on his own without making it difficult at any stage for them to understand. Lastly, PodSquad box contains a list of activities and the skills utilized by your child while performing, this gives a great insight for parents to understand their child’s ability. 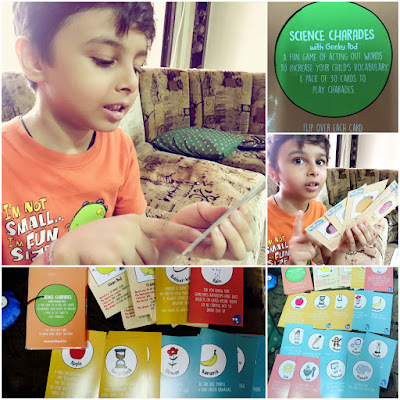 PodSquad’s “The Crazy Scientist” comes with a pack of three different activities that keeps the child engaged for hours and hours promising loads of fun. This activity was super fun for my child as he had never done something like this ever before. It got real interesting when he kept following the instructions without anticipating how it’s gonna turn out. His enthusiasm was pretty much visible when he held his own slimy in his hands. His very own slimy kept him occupied for quite long and he proudly called it his first invention. 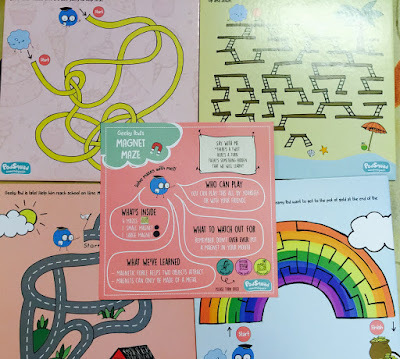 The activity comes with a pack of 30 cards with some interesting facts on one side designed to work on the child’s vocabulary and to enhance the art of enacting the words. Its a pretty interesting mix of game and education that can be enjoyed either with other kids or can just be played single handedly too. The most eye catching object in the kit was the sand timer that took my sons attention and he immediately figured out that all activities needed to be completed within a time frame. I liked the way his eyes were on the sand timer while doing his activities but the sand slid little too fast… hahha! While we indulged in this science of charades game … He didn’t forget to point out..Time is running out mom with his sand timer in hand. Geeky Pod’s Magnet Maze : A game of navigating magnets through mazes to experience magnetism first- hand. The activity kit contains 4 board maze games with magnets. My son literally looked stunned at the magnetism experience he had with the magnet maze, playing maze with the magnet was a different experience altogether. The magnets kept him busy for quite long and I saw him experimenting different ways of pulling and moving the magnets by each other’s magnetism. Above all there is a free Geeky pod collectible and a pod story book comes along with the kit. 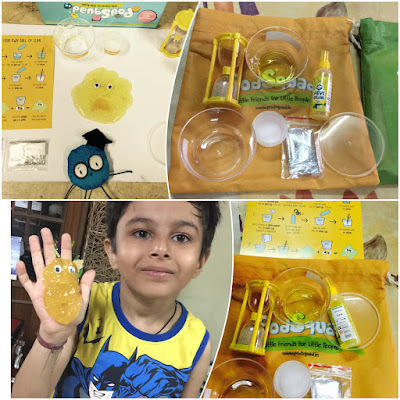 I honestly felt the activity kit kept my son busy for good 2 hours especially when his first ever experiment turned into a slimy and he couldn’t resist but shared with all his friends and boosted of his experiment. He very well organised his own schedule and rearranged his box to secure the rest of the activities for next two days. In my review it’s really been an exciting experience with Podsquad. 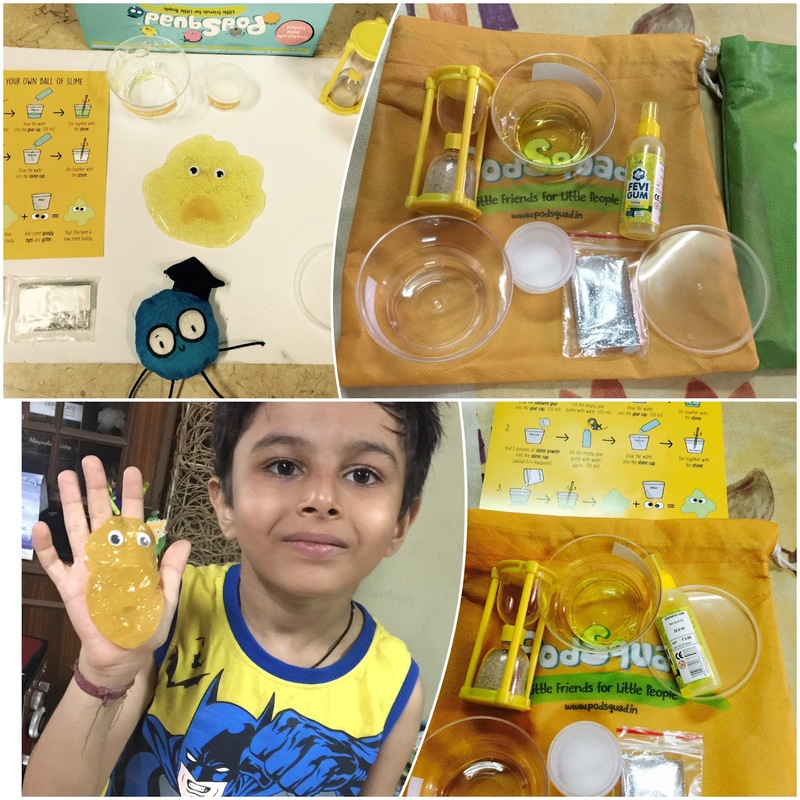 I would recommend parents to subscribe to this wonder kit which promises to be lot of fun for the child along with a great learning experience. The learning through fun and play stimulates child brain to think smart and helps them retain for longer. 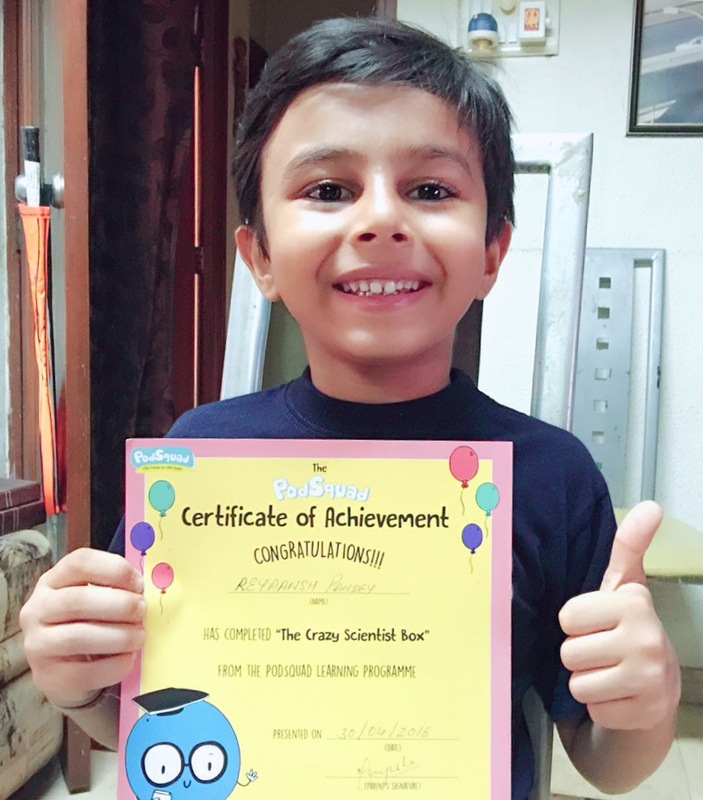 Most importantly PodSquad comes with a certificate of achievement that can be given to your children after a successful completion of the activity and it definitely works as a big boost for the child’s confidence and a reward for your deserving kid. Here’s rewarding my Geeky Pod for his efforts, learning and fun! Do visit their website to subscribe online and further product related queries.